“Mr. 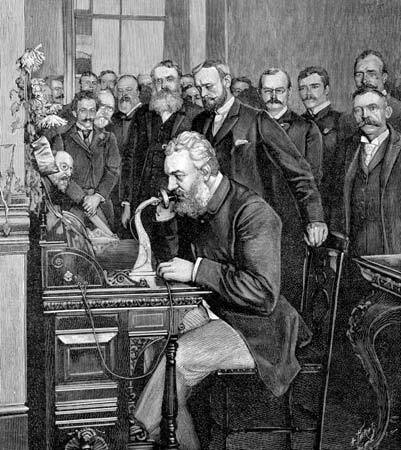 Watson, come here, I want to see you.” These were the first words ever spoken over a telephone line and said by the man fondly described as the father of the telephone, Alexander Graham Bell, who would have turned 170 on 3 March this year. Reflecting on Bell’s birthday and his important contribution to how we communicate today, made me think about his unrecognised contribution to the financial services industry too. Initially, the impact of the telephone on banking was evolutionary rather than revolutionary. It was not until 1980 that telephone banking system was launched. But since then, the rapid transformation in the ease, ways and how banks communicate and transact with customers around the world, is simply astronomical. As we all know, the humble telephone is no longer something wired and static we only use to speak to each other. Our telephones have become mobile computers. They have revolutionised daily life and the relationship between banks and their customers. To consumers, smartphones are the new bank branches. They are the new payments cards; the new way to shop, plan and invest. They are also having an incredibly positive impact in transforming under-developed societies around the world. For example, mobile phones have arguably revolutionised the way of life for Africa’s population in the last decade, both in how they communicate and how they manage their finances. Most African regions, the same as other parts of the developing world, do not have a traditional banking and fixed line telephone infrastructure. This has inhibited business growth and slowed the much needed economic transformation of many African nations. Mobile networks are filling the gap. While the western world may take the benefits of our mobile and smartphones for granted, for many Africans they represent a whole new way of life. They enable people to carry out all the essential needs and tasks we have had access to for decades. Like a bank account and the simple task of being able to put the money you earn in a safe place and have easy access to it whenever you need it. Turning to EMEA as a whole, with new secure digital ecosystem, we are able to unlock and explore this new mobile world in currently unrealised ways. It’s not just about mobile platforms of course, but the possibilities offered by open platform development, data analytics, collaborative technology and more. We’re particularly focused on exploring ways of speeding up the metabolism of the industry with a common blockchain. The goals being to reduce errors, radically cut costs, improve flexibility and strengthen risk management. All of which will together create a more secure financial market infrastructure focused on safeguarding the financial future of Europe’s 500 million citizens, as well as facilitate future growth for business – particularly small and medium sized enterprises (SMEs). I like to think that whilst Bell could not have predicted the transformative impact his simple telephone invention would have on society, he would be proud to see what it has enabled and inspired. And as an inventor, engineer and innovator; like me, he would be even more excited to see what is yet to come.